DataPaths’ communications, software and services solutions are deployed across 40 countries, on all seven continents. Its MaxView Enterprise Management System provides remote control and automation monitoring control for satellite and broadcast communications, as well as government and commercial systems. Using MaxView, network operators can see and manage an entire communications network in a single view without having to interpret dashboards from multiple proprietary systems. Users can control their network using MaxView, and can automate complex tasks and gain insight through its analytics engine. Using one system instead of many means less complexity and training, and lower support costs. MaxView also enables scheduled changes without human involvement. For example, if a device fails, MaxView will automatically switch over to a backup, or notify users, send e‐mails, or make phone calls. For DataPath, the development challenge with MaxView is twofold: providing highly customizable solutions for a widely divergent customer base, and ensuring uptime in sectors where downtime is simply not an option. The MaxView modular product suite can be customized for specific customer user interface requirements—customization is a key sales feature. As such, DataPath needed a technology solution that would make it fast and easy to customize MaxView according to distinct customer interface requirements. Enter ActiveTcl. Tcl (Tool Command Language) is a powerful dynamic programming language used frequently for networking, administration and testing, and ideal for cross platform development. DataPath relies on ActiveState’s ActiveTcl language distribution because it is a complete, ready‐to‐install commercial grade distribution that works cross‐platform with Windows, Linux and Mac OS X plus Solaris, AIX and HP‐UX. DataPath knows it can count on ActiveTcl’s stability and ActiveState’s solid reputation when it comes to ensuring uptime. “ActiveState’s reputation and support of dynamic scripting languages is unparalleled. 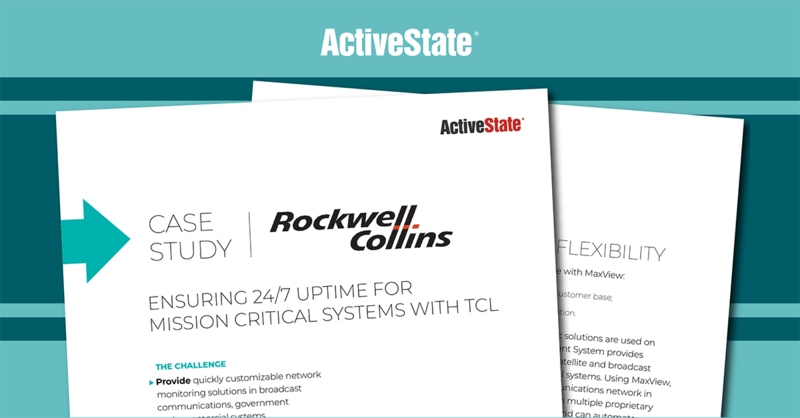 ActiveTcl is the best‐supported distribution of Tcl that I know of,” Ogram says. For DataPath, it’s all about the rapid development and ease of customization. “There’s a quick learning curve. Our customers have learned to go in and start doing customization work themselves.” Ultimately, ActiveTcl ensures MaxView is faster to develop, easy to customize, and stable. And with those bases covered, DataPath can provide a high quality product that consistently meets its customers’ needs. To enable these capabilities and embed ActiveTcl in MaxView Enterprise, DataPath uses OEM licensing from ActiveState, allowing them to take their product to market faster with the right licenses in place. ActiveState is the world leader in enabling companies to develop, manage, and distribute applications with dynamic languages. The company’s products and services for Perl, Python, Tcl and other web languages are used by over 2 million developers and 97% of the Fortune 1000, to build and run applications from mission‐critical to open source projects. ActiveState’s end‐to‐end solutions include development tools, language distributions, indemnification, OEM solutions, support and other services. With these, customers such as Cisco, CA, HP, Bank of America, Siemens, and Lockheed Martin are able to accelerate productivity, minimize risk, and ensure compliance.